Free RSI expert advisor is a completely free expert advisor that trades using rsi level crosses. You can set which levels the Ea should use to open and close trades. The various settings are explained below. NOTE: The default settings are just place holders and not necessarily the best. Use the settings that best suites you or your strategy. Lots- This is the lot size of the EAs trades. 0.1 is the default setting. AllowBuy- Set to true to allow buy trades. This setting is true by default. AllowSell- Set to true to allow sell trades. This setting is true by default. StartHour- The terminal hour of which the EA should start trading. EndHour- The hour of which the EA should stop trading. By default the EA is set to stay active the whole day. RSI settings- These are settings for the RSI to be used. Default settings are as the default mt4 RSI settings. 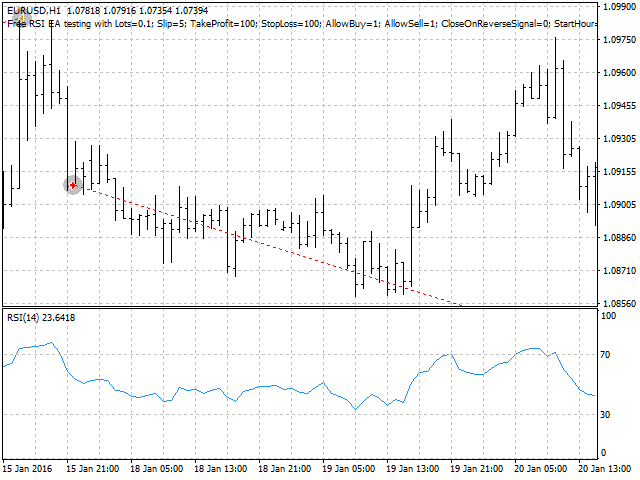 BuyPoint- RSI level of which if crossed upwards, a buy trade opens and any open sell trade from the ea is closed. SellPoint- RSI level of which if crossed downwards, a sell trade opens and any open buy trade from the ea is closed. MagicNumber- This is the unique identifier for the EAs trades. This number must be different for each chart you've attached the EA only if the chart currency pairs are the same.